As from Sunday 24 April the club will be rolling out 2 Sunday spins. Both will leave the Meadowlands at 9 am each Sunday. It’s intended that one will be at a distance of approximately 70-80 km with a shorter 45-55 km spin. 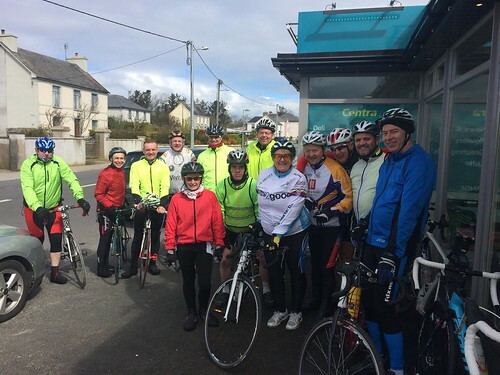 Joe and Paul will lead out the longer version this coming weekend around the Lacey Cup route with Dave and John heading to Castleisland via Dan Paddy Andys. The routes are an advancement of our mentoring programme. Re-named Sunday A and B groups. All club members are encouraged to come along and participate. They are a great chance for members who can’t cycle Saturdays or for those who would like a spin after Saturday. The emphasis won’t be on speed. Just 2 distances that will hopefully be to everyone’s benefit.